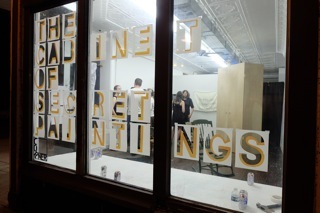 I have an article up at Chicago Artist Resource, about the current show at Corner Gallery, The Cabinet of Secret Paintings. It’s a fascinating premise and performance/show. Elaine, Thank you for sharing this- what an interesting concept. I would imagine all artists have secret creations. To find a way to show them anonymously, in this way is just too cool. Thanks! I agree, it’s a really exciting concept for a show, I’d love to see people replicate it, assuming that’s okay with Betsy.